We’ll begin with Halo Reach. It’s apparently Bungie’s last Halo game, however I guess Microsoft is going to continue the franchise with another developer. What Bungie have done is modernise the Halo series, make it more accessible, very varied and they have also taken influence from other games. The result is kind of short, but a fantastic experience. If you are a brand new Xbox 360 owner and have never touched the Halo series before, this is probably a great place to start. Even if your interest is just to get a FPS shooter. If you end up loving this game; I would recommend you move on to Halo 3 and Halo ODST. Halo 3 is actually longer, but requires you to be little more of a fan to really enjoy. 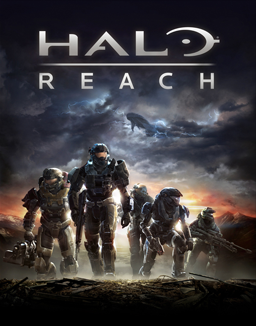 Halo Reach perfectly blends the spectacular environments from Halo 3 and adds some of the dark mood from ODST. What’s more, it is graphically modernised to be right up there with the best FPS games and makes the worlds much larger and more open. The sense of being part of a large war is evident, the guns all look and feel more satisfying this time around and the environments ooze atmosphere! The older Halo games could often have a lot of repetition and dragged on for too long with certain areas. Halo Reach however is really varied. Each environment looks distinctly different and the objectives and missions you take part in are something new in each chapter. I mean for crying out, one level you fight an open beach-landing fight, then some close combat in a building, then you jump in a spaceship, travel into space and fight in a large scale spaceship battle only to end up on board a huge mothership and battle it out in low-gravity. It simply blows you mind away. Add the more realistic approach to the cutscenes and the more gun orientated influences from Modern Warfare, you have got yourself an amazing FPS game. Sure I have some complaints. The framerate drops at times, and it’s noticeable that the graphical overhaul on the Halo 3 engine has been a little too much for it to take. The length of the game is also clearly made to compensate for inpatient random gamers, Halo 3 felt much longer! It’s like many FPS games these days; you’re just getting into it when suddenly the credits roll. The length can be helped with the coop mode and playing the game on a harder level though. Coop being really fun and the way I’ve played all the Halo games. Even though you are a Halo fan or new to FPS’s and the series, you should pick this game up without hesitation. It misses the top slot for covering a lot of old ground, and being too short. “Halo Wars, it’s a lot like Command & Conquer with a Halo theme!” was the first thing that came to my mind playing this game. In a way that sentence sums it up well. Playing RTS games on consoles isn't really something I'm very fond of usually, but Halo Wars proved to me that it does indeed work out well. The menus and steering is highly optimised for the Xbox 360 controller and the simple nature of upgrading units and building your base makes Halo Wars enjoyable as a console RTS. This isn't a Bungie produced game, but the Halo “vibe” is very present. The vehicles, old and new, all look great and look exactly like they do in the Halo FPS games. The cutscenes are fantastic and bring together an exciting story set in the Halo universe. I actually played through the game coop with a friend, and it really should be the way to play it for everyone. You can share units and the best strategy is for one to build and uphold the base and units, while the other person concentrates on the battle against the enemy. The game is quite challenging at points and gives you often very little time for decisions. So you’ll most likely end up replaying a lot of the missions. Being familiar to the Halo universe lets you easily understand which units are best towards the enemies. However as the game progressed I felt the number of units and availabilities for upgrades were limited. It felt like C&C “light”. I'm guessing the amount of memory and such on a console kind of holds this variety back, RTS games are kind of perfect for the PC platform. All in all though I enjoyed the game, the story was interesting and kept me going. The gameplay is easy to learn and is probably the best RTS controls I've tried on a console before. It’s a perfect game for anybody looking for an easy to pick up C&C-like game for their Xbox 360 and of course if you enjoy the Halo series and want something different. I have not tested the online multiplayer modes.